In June, the Media Research Center launched the largest outreach campaign in its 18-year history, “Tell the Truth!” a $2.8 million campaign to expose and neutralize liberal media bias in 2004. To reach that goal, the MRC implemented a plan—which is now ongoing—to give at least 50 million Americans every single week the evidence of the liberal bias of the three networks and the major newspapers, and to help mobilize conservative groups to work together against that bias.It was an unprecedented campaign. To start, the MRC used its existing products to aggressively promote the “Tell The Truth!” campaign. These included the daily email CyberAlerts, Media Reality Check faxes, special features on the Web site TimesWatch.org, four major Special Reports from the Free Market Project, the monthly FLASH newsletter, the MRC Web site, and a weekly fax report, Worst of the Week. In addition, the MRC purchased advertising on billboards around the country: in Dallas, Boston, Atlanta,Cleveland and Philadelphia. The MRC also purchased advertising on Direct Response TV, Fox News Channel and PAX TV. A viral email campaign was launched in October, targeting grassroots activists and providing them with the means to easily send hundreds of thousands of messages to the network news’ headquarters and their affiliates. That email campaign overlapped with a grassroots membership drive by email, which provided “Tell The Truth!” information to MRC members, donors, and Web subscribers, and called on them to challenge media bias. This drive added an additional 29,000 new members to the MRC. 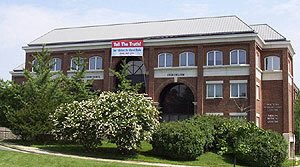 Tens of thousands of bumper stickers, coffee mugs, pens, and t-shirts with the “Tell The Truth!” slogan were distributed or sold. And President Bozell’s book, Weapons of Mass Distortion: The Coming Meltdown of the Liberal Media, was released in early July, timed to quickly follow the launch of the “Tell The Truth!” campaign. MRC material was cited on Rush Limbaugh’s radio program, Sean Hannity’s radio show, the Drudge Report, Fox friends, CNN, Special Report with Brit Hume, the New York Times, USA Today, and many other outlets. With the MRC’s efforts flooding the market, the MRC could tabulate its media citations—radio, TV, print, Web—and corresponding market audience to monitor and calculate the impact of “Tell The Truth!” weekly. Tracking those numbers showed that the “Tell The Truth!” campaign was reaching more than 50 million Americans each week. For instance, the “Tell The Truth!” campaign, following its mid-June launch, reached an average of 59.5 million people weekly in July. In August, 61 million people a week; September, 68 million; and, in October, 72 million households weekly. The television advertisements, launched in December, reached more than 95 million households. 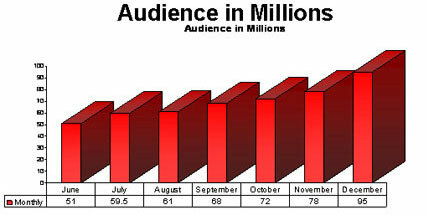 Weekly audience numbers for “Tell the Truth!” never dipped below the 50 million mark. As the summer turned to fall and liberal media bias increased towards Election Day, the effectiveness of the “Tell The Truth!” campaign also increased. On Nov. 5, three days after the presidential election, a Fabrizio, McLaughlin & Associates poll showed that almost 1 in 2 voters saw media coverage as being biased, and overwhelmingly biased with a liberal slant. The “Tell The Truth!” campaign succeeded in exposing, and neutralizing, their bias. More Americans, day after day, are learning about liberal media bias. The “Tell The Truth!” campaign—along with the longstanding work of the MRC—is, in large measure, responsible for that.